There are affordable options for Comerica park parking, but it helps to know what you’re doing ahead of time. Like many post-Camden Yards ballparks, Comerica was placed in the heart of a city, but Detroit only recently added a light rail for easy transit, and parking is still what most fans do. This creates a unique situation, in that there’s a wide swath of city blocks with off-street lots and garages that charge for parking on game day. It’s a good idea to decide where you’re going to park beforehand, so here are three good suggestions from my own experience. They sometimes involve arriving early, so have a plan for something to do. Well, you can’t miss the sign at least. 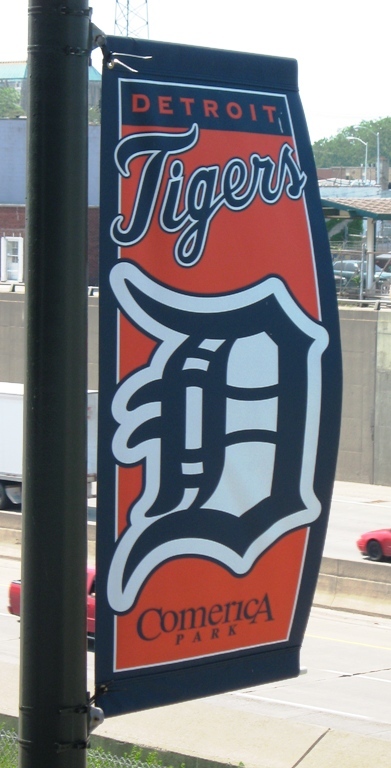 Comerica Park Parking, Tip #1: The Greektown Casino Garage. 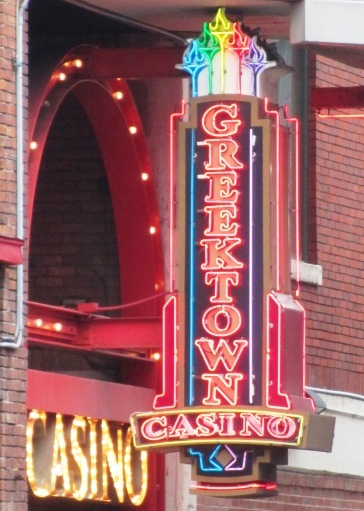 The Greektown area in Detroit is full of restaurants and bars, and the Casino garage is not only in the middle of it, but it’s also very easily accessed from I-375 and a quick and easy out. You used to be able to validate your ticket in the casino and park for free on game days, but that isn’t quite so easy now. The official policy, so I was told, is that you need to accumulate a certain number of points on your card and that will make your parking free. But if you’re not into giving a casino money (they don’t build those chandeliers with your winnings), you can show up well before the game starts and often escape without a fee, especially if it’s a weekday or other low demand game. I managed this twice in my last visit. If it doesn’t work, at worst you pay a small fee–$10 as of this writing–and you can park your car all day in a covered, attended garage that’s a short walk or People Mover ride to the ballpark. And you can get a great meal nearby before or after the game; lots of good eateries in Greektown. I’ve been told not to hang out there too late though. Comerica Park Parking, Tip #2: The Fox Theatre Garage. 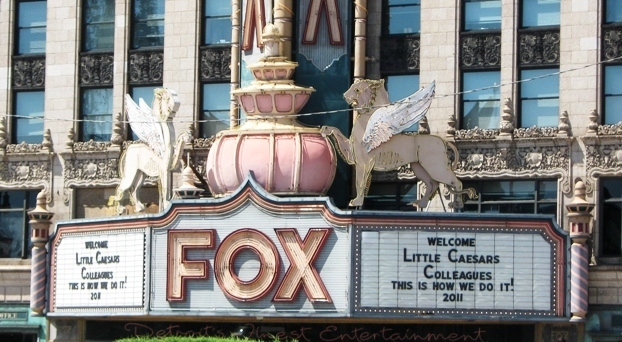 In 2002, I was on a baseball trip with a companion, and I parked my Mustang in the Fox Theatre garage in the morning, for a night game, so that we could get on the People Mover and see downtown Detroit attractions for the day. This was well before I had offspring, so I wasn’t overly concerned about the parking cost. The Fox Theatre is practically across the street from the ballpark, on a game day I figured it would be $20-25. But as we pulled out of the garage after the game, the bill turned out to be just a mere $2. Two bucks to park across the street from a major league ballpark. Even in 2002 that was unheard of! And again, if it doesn’t work, you’ve parked your car in a covered, attended garage that is very close to the ballpark for a fee that isn’t too bad. Even indoors, the Lions still play in any weather. Comerica Park Parking, Tip #3: The “Other” Ford Field Lot. 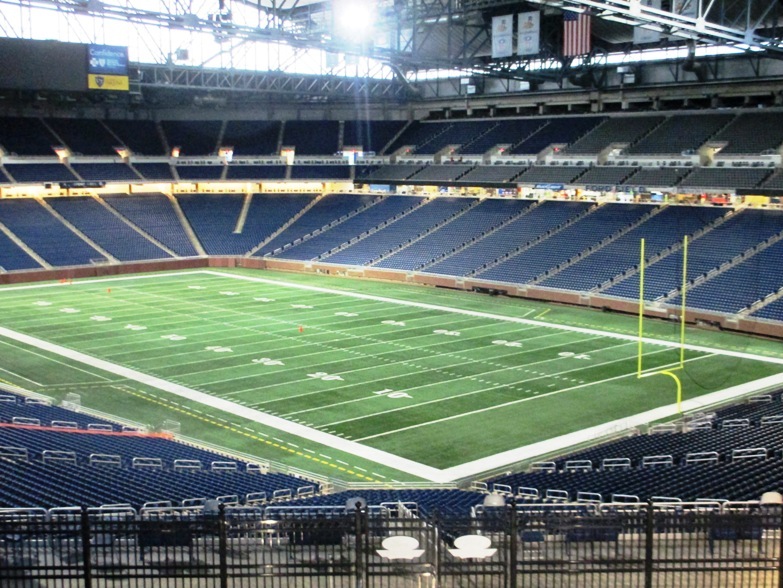 Ford Field, the home of the Lions, is right next door to Comerica Park…you can see the name of the place on the building from most of the seats. Ford has a high end lot where tailgating is allowed, on Montcalm Street adjacent to I-75, but this lot costs about as much as the Tigers lots near the ballpark…and they’re not cheap. But there is a much cheaper lot on the other side of the football stadium from the ballpark, and it’s nicely convenient to the I-75/I-375 interchange for an easier out than most lots. The best part about this spot is that on most days you can actually walk through the impressive dome to the ballpark, see the football field and even grab a bite to eat at the food stands inside. Great on a less than perfect day and you can put some grub in your doggie bag for the game. Unfortunately you can’t walk through the stadium on the way back…probably because you won’t be hungry then. But you may pass by some very talented bucket drummers on the way to your car. Well worth it. That’s just three Comerica Park parking spots…there are many other ways to get to Comerica, and there’s probably a way to get there that suits your taste and budget. Stay tuned, I’ll add more.